Does HomeAdvisor really work? 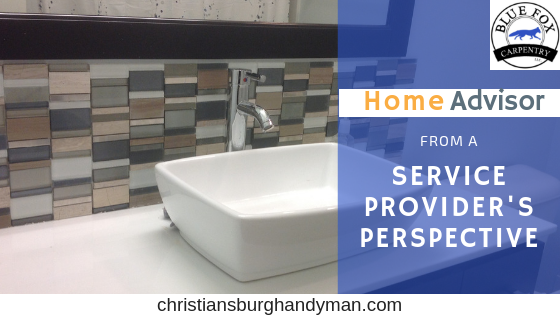 In this post, I'll outline my experience with HomeAdvisor, Thumbtack and Porch, and how I think this fits into the overall home services market. HomeAdvisor is one of many lead generation services that have entered the marketplace in recent years, promising to connect home owners with service providers. In addition to HomeAdvisor, Thumbtack, Porch, and Task Rabbit provide a similar platform. As a homeowner, these services allow you to enter your project details without any fee, and then they sell your "lead" to service providers like myself. What does it cost a service provider to use HomeAdvisor? While HomeAdvisor's platform is free to the homeowner, service providers must pay. HomeAdvisor charges me a modest up front annual fee to participate in their platform. The last time I looked at it, this fee was around $350 per year. I tell HomeAdvisor what types of services I offer and what types of leads I would like to receive, I also select a monthly budget. HomeAdvisor then automatically sends me the type of leads I requested, until I reach my monthly budget. I have the ability to pause my leads temporarily, and there are some additional ways I can tailor the type and frequency of leads that I won't detail in this post. HomeAdvisor has been more aggressive than the other platforms with its television marketing campaigns. I don't have any hard data, but it seems to have the highest market share in the industry. It promises to deliver pre-screened and competent professionals to your door. It also promises online booking. So can it do all this? I think the platform is limited and must make major changes to its pricing structure if it intends to remain competitive. Problem #1 - Service providers pay for the lead, but very few homeowners return the phone call. If every lead HomeAdvisor billed me for actually lead to a phone call or email exchange with a real client, I might be able to justify this as part of the marketing expenses for my business. However just as homeowners get burned by unresponsive service providers, my experience is that only about 1 out of 10 leads provided by lead generation services like HomeAdvisor lead to an actual conversation. Then it often takes 3 or 4 conversations to actually sell a job. That means I have to receive 30 to 40 handyman leads from HomeAdvisor, costing between $350 and $500 total, to sell one handyman job that may gross the same amount. For handyman services, $500 is too much to pay for what is probably a single $250 transaction. I applaud Thumbtack for taking this problem seriously. Earlier in 2018, Thumbtack revised their entire billing structure. Now service providers only pay if a homeowner responds to their calls in a meaningful way. It takes a legitimate dialog, not just a quick - "no thanks" for Thumbtack to charge me. This is a more reasonable pricing structure, with this model I may pay $50 to $100 in lead fees for a $250 to $500 job. Still not a great ratio, but if the client becomes a repeat client then it is worthwhile. For a variety of reasons, youth just aren't choosing construction trades for a career. Every contractor I speak with talks about how difficult it is to staff their business. My personal experience hiring has been that only about 1 in 15 people that show interest in a job posting actually show up for an interview. Of those that show up, only about 1 in 5 are sober and trustworthy, and this individual will need extensive training to become a valuable contributor to the business. That means that if I post a job listing on Craigslist, I have to interact with about 75 people to make one hire. When it's this hard to staff a home services business, I take it as an indicator that there aren't enough people interested in the occupation. Working directly for homeowners requires more organization and planning than working under a builder or general contractor. A small trade professional may maintain a relationship with between 2 and 5 general contractors that fill their schedule on a regular basis. For this reason, many trade professionals choose not to market their services directly to homeowners. Quality trade professionals usually only need leads for new work within the first 18 months of starting their business. I've interacted with a LOT of contractors in the area over the last 6 years. I've found that the majority of trade professionals that are technically competent and conduct their business with integrity consistently have more job opportunities than they have time to complete. Among the service professionals that I interact with, I only know of one that consistently uses lead generation platforms. I don't expect lead generation services to disappear. They may even work reasonably well for specific occupations like house cleaning or pressure washing. For the construction trades they don't deliver enough value to justify their cost, and as long as there is a shortage of skilled, professional craft people it will be hard for them to consistently deliver on their promises to homeowners.